Fritz is about 120cm tall and weighs only 7kg. Its main joints are driven by 16 servo motors: 5 in each leg and 3 in each arm. Its head has also 16 DOFs. 3 servos move the eyes and 3 servos drive the neck. Fritz has 4 DOFs to animate the eye browns and 6 DOFs to animate the mouth. 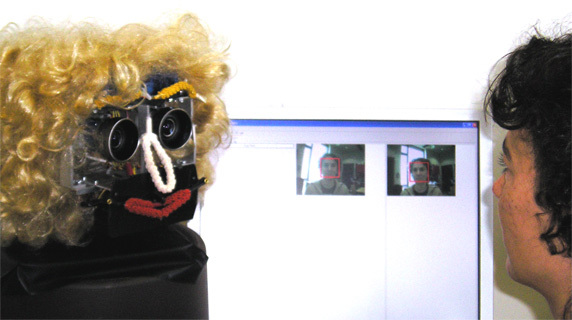 Using speech recognition, speech synthesis, face localization, speaker localization, facial expressions, and gestures with eyes and arms, Fritz can engage in multimodal conversations with multiple persons. It explained smaller robots to the visitors at the Science Days 2006 at Europa-Park Rust. 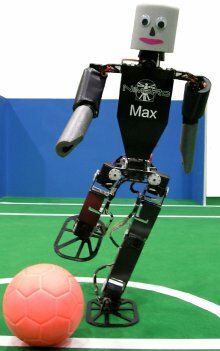 At RoboCup 2005 in Osaka and RoboCup 2006 in Bremen, we used Fritz as TeenSize goal keeper. These robos have 19DOFs, which are driven by servo motors. Jupp and Sepp are 60cm high and have a weight of 2.3kg. Max is 75cm tall and weighs 2.4kg. The robots have strong arms that help them to get up from the ground. They are controlled by a Pocket PC and have a compass to make localization easier. Jupp and Sepp played sucessfully in the KidSize class at RoboCup 2005 in Osaka, Japan. Only Team Osaka was better. Max was the best larger Robot in Osaka. It won the Penalty Kick competition. Our 2005-robots also played at the RoboCup-Event in Magdeburg, at Roboludens in Eindhoven, at RoboCup 2006 in Bremen, at the open house in Dagstuhl, at Science Summer in Munich, and at the Science Days in the Europa-Park Rust. The body (without the head) of our robot Alpha has 17 degrees of freedom (four in each leg, three in each arm, and three in the trunk). The joints of the robot are driven by Faulhaber DC-motors of different sizes. The robot's total height is abi155cm. The skeleton of the robot is constructed from carbon composite materials to achieve a low weight of about 30kg. Alpha's head consists of 16 degrees of freedom, which are driven by servo motors. We have 3 DOFs to move the eyes, 3 DOFs to move the neck, 4 DOFs to animate the eye browns and 6 DOFs to animate the mouth. Using speech recognition, speech synthesis, face localization, speaker localization, facial expressions, and gestures with eyes and arms, Alpha can engage in multimodal conversations with multiple persons. 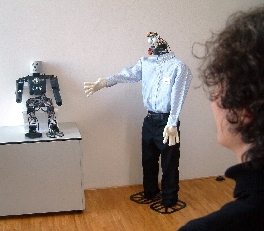 It explained smaller robots to the visitors at the Wissenschaftsmarkt (Science Fair) 2005 of Freiburg University. 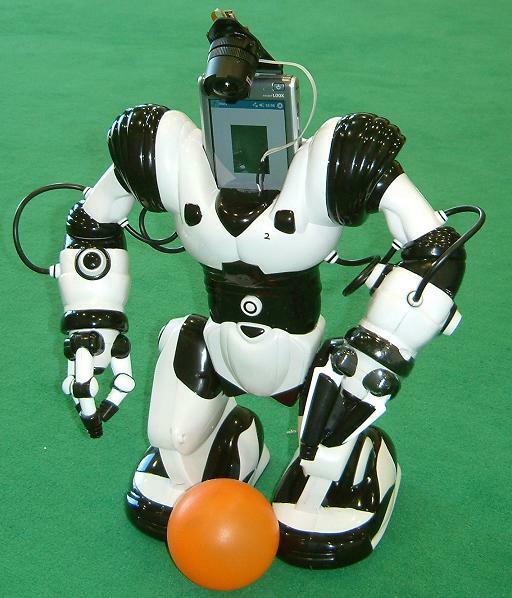 At RoboCup 2004, Alpha took part in the Humanoid League Free Style competition of and won the third price with a dance performance. 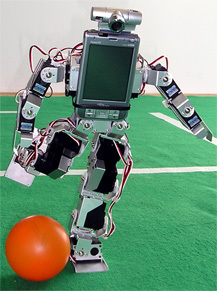 This robot is based on the Bioloid construction kit of Robotis. It has 19DOF. We made it autonomous by adding a Pocket PC and a camera. Now its size is 44cm and its weight is 2,2kg. 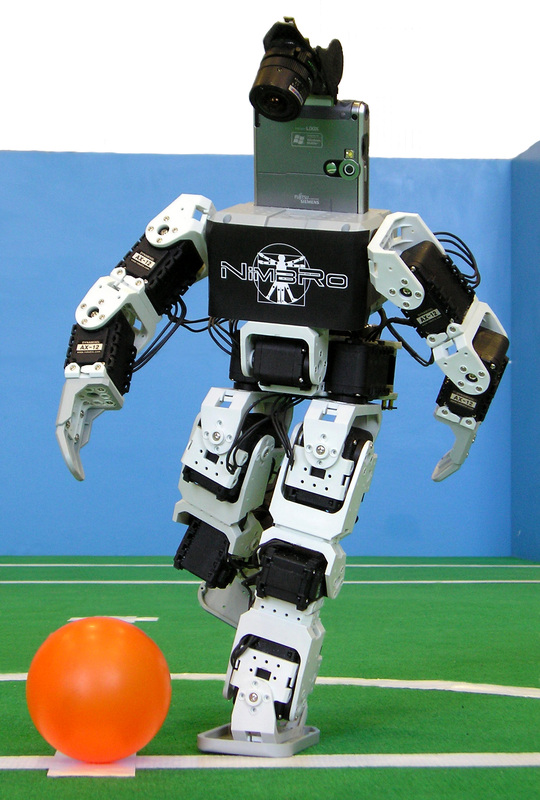 We used it in a student lab project to play RoboCup soccer. 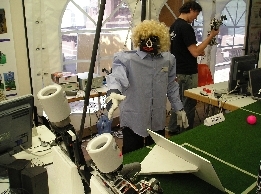 It participated at the RoboCup-Event in Magdeburg (March 2006). Toni is driven by 18 servo motors: 6 in each leg and 3 in each arm. Its size is 74 cm and it walks at a speed of about 20cm/s. Power is supplied by an onboard battery. The robot is controlled by a Pocket PC with a camera. While the Pocket PC is located in the trunk the camera is positioned in the robot's neck. Toni had its first public appearence at the Chaos Communication Congress 2004 in Berlin. 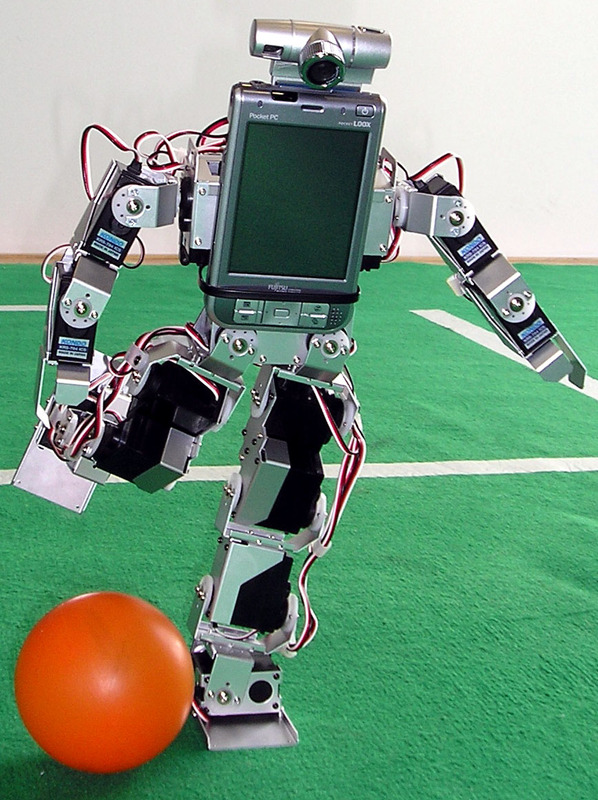 It kicked penalties at RoboCup German Open 2005 in Paderborn and at RoboCup 2005 in Osaka. Toni was shown at AMAM 2005 conference in Ilmenau and displayed at the Baden-Württemberg house in the new Mercedes-Benz Center in Stuttgart during Summer 2006. We made the RoboSapien, developed by WowWee for the toy market, autonomous by replacing the head with a Pocket PC. The Pocket PC is equipped with a camera and communicates via infrared to the robot. At the German Open 2005, we played 4 vs. 4 demonstration games against the Brainstormers Osnabrück. As NimbRo RS the robot took part in the RoboCup 2004 Humanoid League competition. It came in third in the Technical Challenge where it walked up and down a ramp without falling (balancing challenge). There is a RoboSapien-API available in embedded Visual C++ for download here. This small robot is based on the construction kit sold by Kondo (see a video). Its 17 joints are driven by servo motors. We added a Pocket PC with a camera to make it autonomous. At the German Open 2005, Kondo kicked penalties. It also was our first robot able to get-up from the ground by itself. Check out our movie archive for videos of these robots!